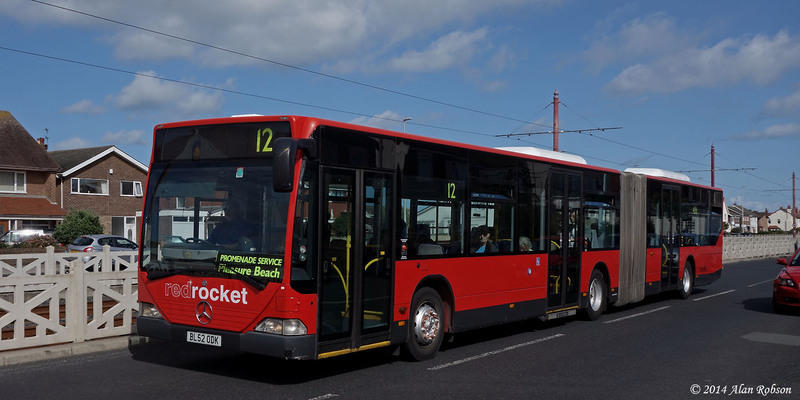 One of Oakwood Travel's Mercedes-Benz Citaro bendy buses was noted in use on the Seafront 12 promenade service on the morning of 7th August. MAL53 (BL52ODK) was spotted heading south in Cleveleys near Anchorsholme Lane, with a temporary destination display on the inside of the left hand side of the windscreen above the dash panel. New electric roller blinds are currently on order, from the same German firm that supplied the ones used on London Citaros. Driver training is due to commence next week for a pool of drivers who will be able to operate the Mercedes Citaros.